Gotta' love those tolerant city officials in San Francisco. Now they're directing their wrath toward Catholic Archbishop Salvatore Cordileone. And for what? The archbishop wants the teachers in the archdiocesan school system not to undermine the Catholic mission by publicly dissenting from Catholic magisterial teaching. Oh, the horror! Sounds entirely reasonable to me. He isn't going on a witch-hunt; he's simply requiring those who teach in Catholic archdiocesan schools to support what the Church teaches. If they can't in conscience do that, they should resign and go teach in a non-Catholic school. It's certainly not unjust discrimination to require teachers in Catholic schools to publicly uphold the tenets of Catholicism. Yet the bullies on San Francisco's Board of Supervisors – and, sad to say, a reported 80 percent of current archdiocesan high school teachers – apparently can't deal with that. 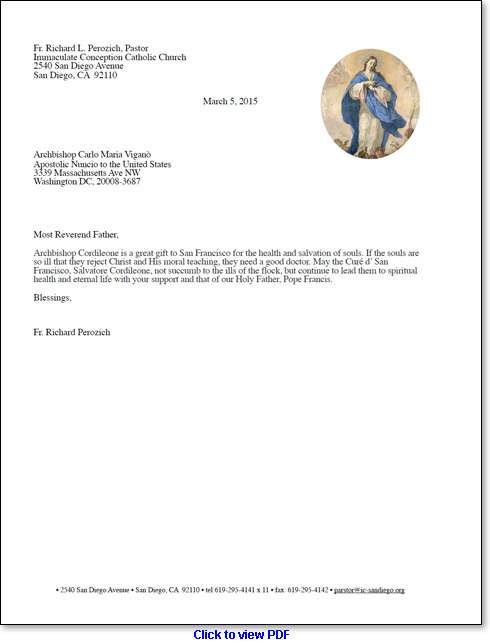 To show your support for Archbishop Cordileone, click here to read and sign an online petition being circulated by LifeSiteNews.com and American Life League. 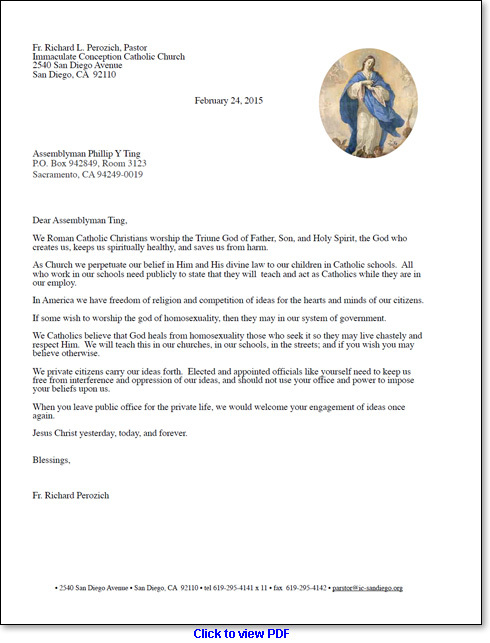 Below are images of two letters written by Father Richard Perozich in support of the archbishop.